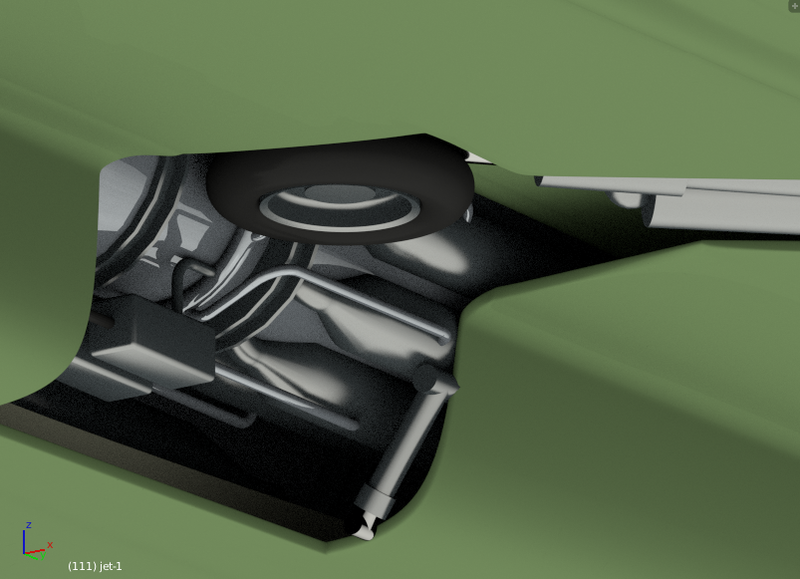 I have been working on my Tractor Transmission (in the WIP here somewhere) for a long time now and have decided that my basic modelling skills need some improvement in order to progress with that model, particularly now I am nearing more complex pieces. So this aircraft is my practice at smooth modelling. I bought JW’s Plane Tutorial (a snip at $14.95) and played with the Shrink-wrap, Deform, Sub-surface, etc. modifiers. This is the first results, before I start to add the serious detail. All the control surfaces work as they should including “Flaperons” sort of ailerons with both downturned to act as flaps, I do the same thing with the elevators as well, that I learnt from my model aircraft building and flying. The undercarriage is also all rigged with a sequence of doors opening, gear stowing, etc. All controls are moved by one Empty for each function, allowing functions to overlap, like flaps down and still control the ailerons. The plane is still in the workshop on jacks as I continue the build. I don’t know what materials and finish to apply yet so its still in bare aluminium and primer. Here are the first two renders, I used Studio015 as my HDRI light source. I’d be grateful for some critiques! Did you use box/faces low poly or nurbs? 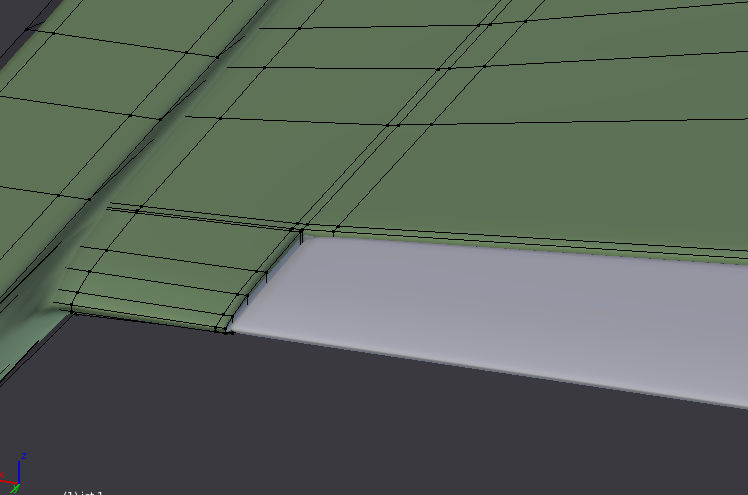 And what about those ailerons, are they separate objects with the center aligned to the mesh so you can rotate them in place? Also, what’s with that trapdoor on top? Are you going to carve a hole so you can add some engine parts and whatnot? Very nice work, kinda looks like a twin engine gripen. Really like how the cockpit is coming along though the glass may be a bit dark. The trapdoor is an airbrake, it helps to reduce speed by increasing drag. The poly count is pretty high - I want good detail, 2,500 odd faces so far. 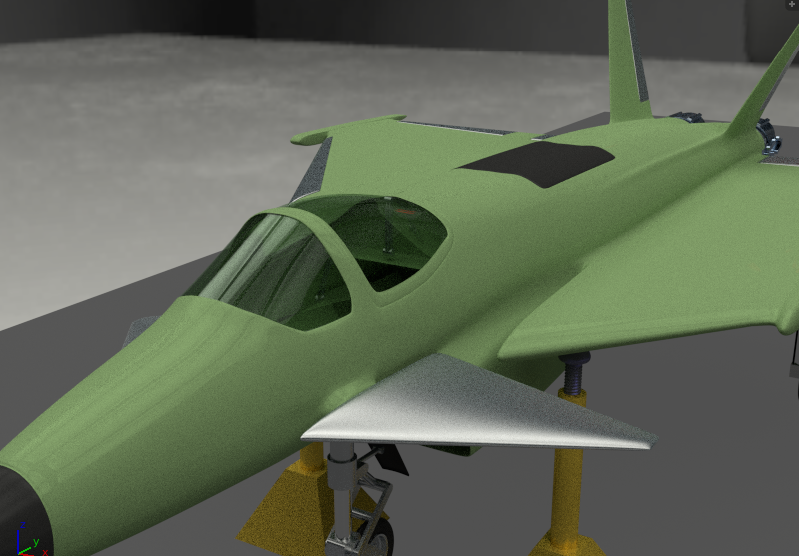 Inspiration for the model is part Eurofighter (Typhoon) and part a model plane I made with two Wren turbines in it at 6 foot wingspan. You’r right - I will lighten the glass a little - I may have the solidify modifier on the glass a little too thick and yes, it is the airbrake. Thanks for the comments, Clock. I think that as an imagined plane it looks good. The wings and controls surfaces have appropriate airfoils (usually the beginners make them like a “desk”). All the fillets, undercarriage and movable parts seems realistic enough. It seems that you have good hand for this work. Usually I avoid commenting models of imaginary planes, because there are no real aircraft to compare. For example: usually the nozzles of the jet engines have circular section (on your fighter it resembles a little bit square with rounded corners). But it is your design, and you ultimately decide, how it looks like. Similar situation in the case of the windscreen. Usually it does not have two curvatures, as yours. (This special armor glass has cylindrical or conic shape). P.S. if writing about “JW’s Plane Tutorial” you mean my book - thanks a lot! I hope it will be useful! (If not - let me know where I can find this tutorial :). I will gladly look at it!). P.S. 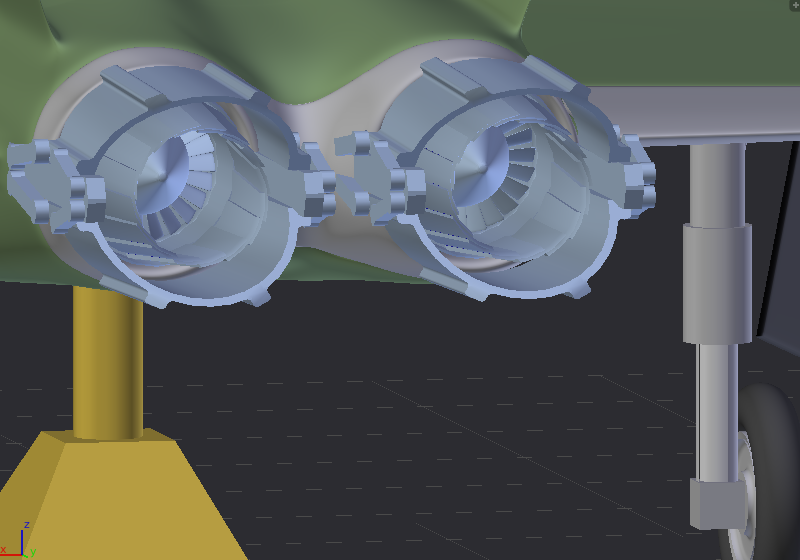 I promised myself to study your tutorial on the F3F landing gear soon (it was a very difficult case). I did not know you have written a book - let me know where I can get it please. I was referring to Jonathan Williamsons tutorial on CGCookie. 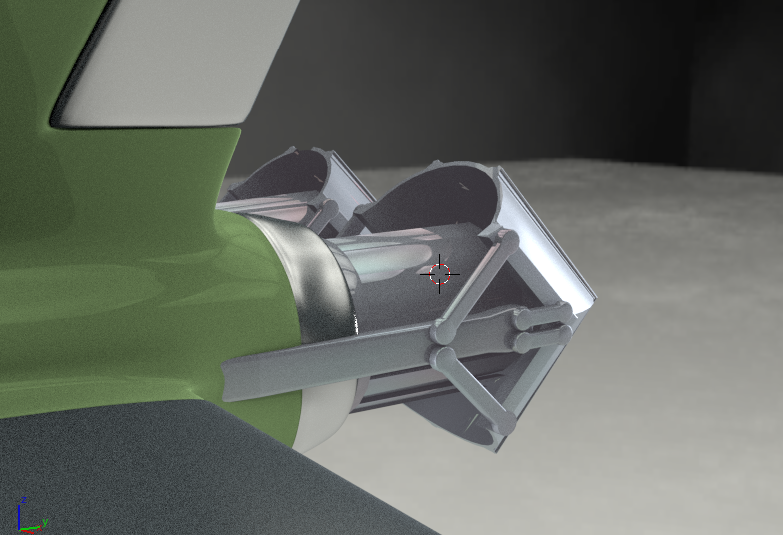 Thanks you for your comments, I have started to correct the jet nozzles now that I have started on the jet pipes. The screen you are of course correct! I will change the shape to a single curvature. Just to make sure - do you mean this tutorial?. It seems to have the same price you mentioned in post #1. Describes the full process of creating such a realistic aircraft model as the one shown on its cover. Over 1300 pages, 2400 figures. Plenty of accompanying Blender files, a few useful addons. Updated since 2011. At this moment the full version uses Blender 2.69, I am working on the third edition, for Blender 2.7. 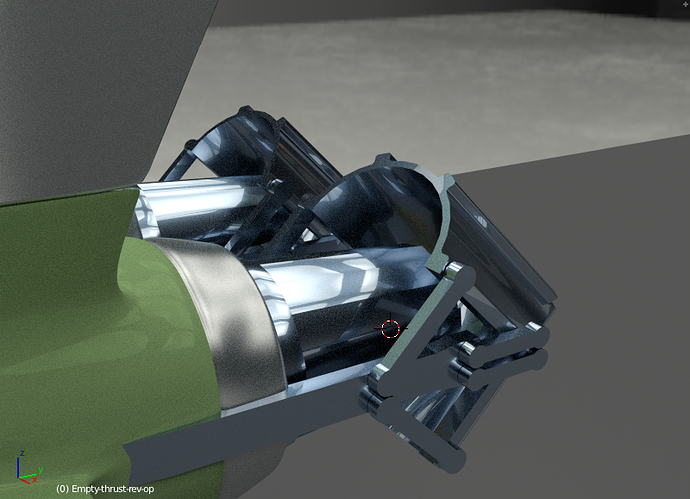 All the bits above are fully operational now with my usual Empty to drive the complex rigging. The turbine blades are very close to reality - my father worked for Rolls Royce Aero Engines as a senior design engineer, hence the interest in planes. I have a solo pilot’s license for gliders, both free and powered. @Witold - yes that is the tutorial - I know the plane is a joke but the techniques stack up well for a beginner in this field like me. I will download the Polish version - then wait for the new version, any English in the new version? A bit of motive power and intake ducting. 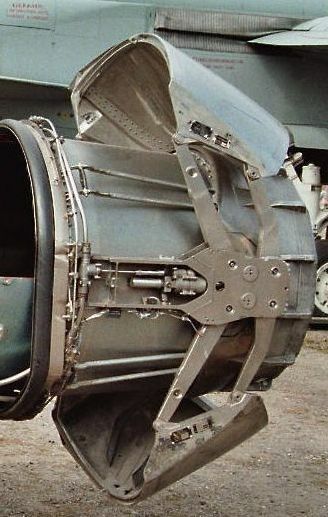 Hi, the landing gear bay looks interesting. From the designer’s view - this rubber tire seems to close to the engine body - I suppose that they would put there a kind of thermal isolation. I will send you a PM about the English translations of my book. Thanks for that I have registered, just waiting approval from the bosses! I think I must get to do a real plane soon. I have my father’s book on “Every Plane Made up to 2000AD” about 3 inches thick, so I will select one from there I think. I have some favourite aircraft, but Spitfires, Lancs and Hurricanes must be over done by now. I might try a Harrier. Yep I shall stuff some asbestos in there! This is the disadvantage of a “imaginary” plane, not everything works all the time, once I have cracked the techniques, I’ll start on a real plane. Thanks for all the help here. Clock. Really nice work so far. (Reminds me I have a made-up jet that’s still unfinished. 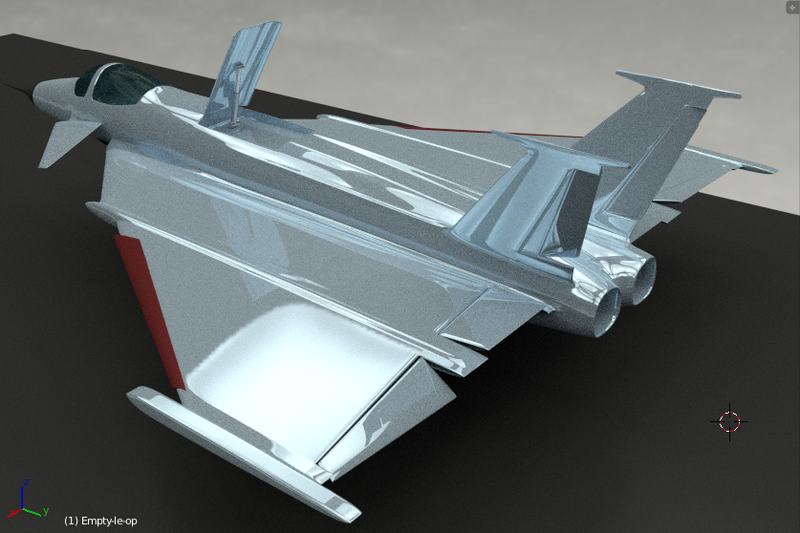 Making it with no real ref, so figuring out landing gear is a pain in the… You’re ahead of me there!) Seems like it’s coming along nicely. 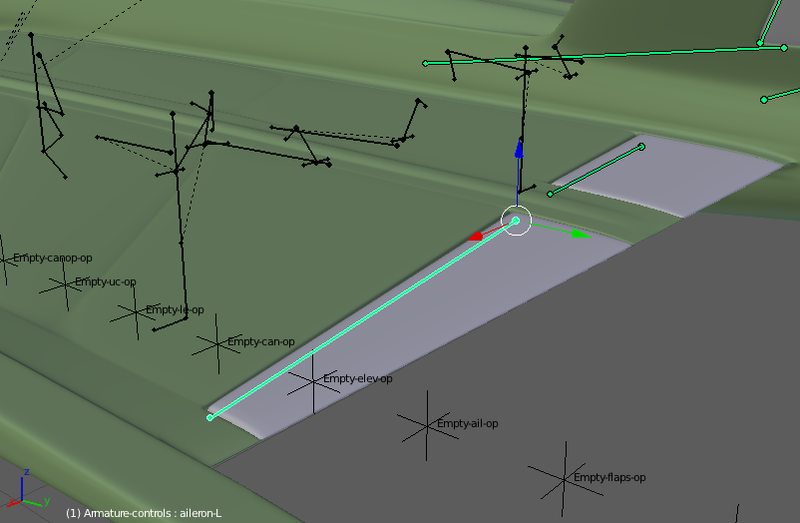 Personally, I still prefer an armature over empties for rigging aircraft, it’s easier to set up a “remote” with custom bones and do a realistic mix and expo on the control surfaces with drivers, and allows use of actions for complex mechanisms. UV’ing and texturing will probably be “fun”. Are you going to merge everything external as one object for that stage, or just going to have separate mappings? I like having a common UV map and texture, but given the process and having to re-name everything after separation - makes me wish there was a proper plugin for UV’ing and texturing multiple object selections at the same time. It’ll be interesting to see when it’s done with all the details, since it looks like it’s about ready to go out on the tarmac and do a full afterburner takeoff as it is. Thanks for those kind words! 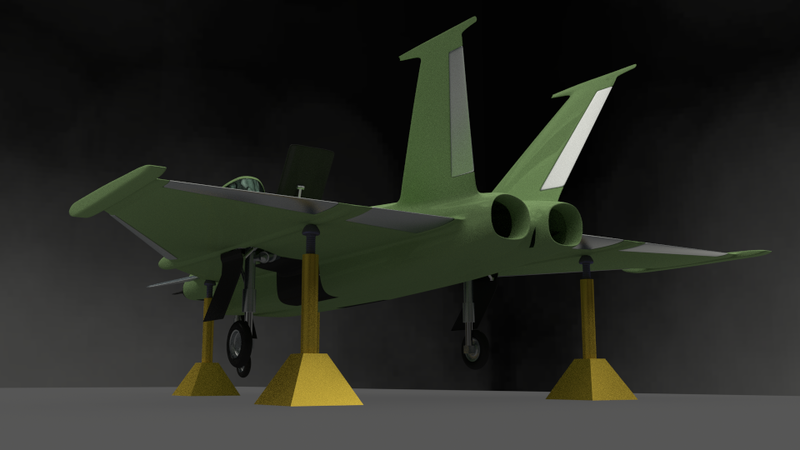 I have animated all the aircraft bits with just 2 armatures, then controlled the bones with a empty, so for example as the undercarriage is stowed, the inner doors open, then the gear goes away, then the inner doors close, followed by the outer doors just behind. This means moving 6 bones for just the main gear and another 3 for the forward gear. So I just put Transform constraints on all the bones to be moved, so they are operated as I drag an empty from X = 0 to X = 5. That way I don’t need to remember the sequence or the timings to stow or deploy the gear - I just drag the empty, and keyframe that over the right number of frames. Same goes for deploying “flap” mode for the elevators and ailerons, then I can still control their own functions separately. Sounds complicated, but it makes my animations so much easier to control and programme. For the control surfaces, I added a bone with its head at one end of the rotation axis of the surface and its tail at the other, then I just rotate it in its own Y axis - G YY etc. or I just control it with an empty crossing X = 0 for positive or negative values, simples! PS I have started work on a real plane - RAF (UK) serial number WH640, I chose this aircraft because my dad worked on it, making a new main u/c door from a sheet of aluminium with just his hand tools, in the desert in 1956 during the Suez crisis. I’ll leave you all to find out what the plane was until such time as I have a worthy WIP to post here. That a good system for rigging! 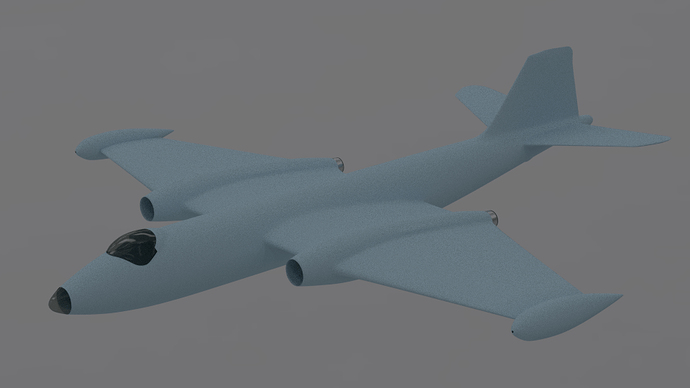 And my guess for what plane WH640 is: An English Electric Canberra Mk.2? Can’t wait to see the WIP! 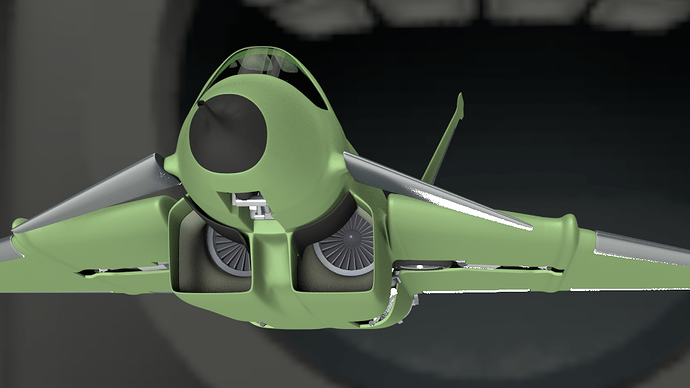 Interesting concept for a plane, is got that JAS-39 Gripen feel to it but with a few Mig features in it, a pinch of Dassault Mirage thrown in and a few bits and bobs from some classics thrown in for good measure, BTW like the rigging approach (Note to self: need to experiment with rigging)…by personal request, can you make some sort of tut on the rigging? 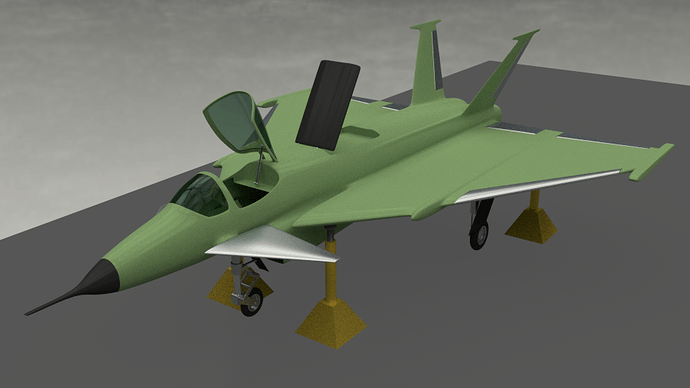 Now all you need is some great textures and this beauty will be ready to fly amongst the great planes showcased here in BA. I have a great deal of work to do on the materials and finish, I am studying @Witold_Jaworski 's excellent book on the subject just now. Cheer up mate! At least you are not freezing your nuts off over there! I’ll start the tut on the plane rig this next week, so please be patient, I should have it done in a couple of weeks. That’s true but call me crazy, I miss the good ol’ English weather and a couple of Carling or Stellas pints. No rush mate, still have plenty of time before I actualy get to the rigging, BTW nice home studio setup you made me remember how stupid I was for not collecting the DeAgostini Supermarine Spitfire…ohh well some day!